This is the blog of Dey Martin Guitars - Luthier/ builder of custom handmade acoustic guitars and ukuleles in Palm Springs, California that are inspired by tradition, using only the finest sustainably sourced and reclaimed materials available. 00-DM 14 fret sinker redwood top on Hawaiian koa back and sides is in the works. The beauty of Hawaiian koa is unquestionable as a guitar tone wood. It mellows out any top it is paired with. Listen for deep resonances and singing natural overtones when matched with the 150 year old sinker top I have selected. Projected completion May 2018. I have recently completed the classical guitar commission given me by the family of Santa Cruz, California luthier Bruce McGuire. Bruce was an inspiration to many, most notably to Santa Cruz Guitars' founder Richard Hoover, and gave of his time and talents to many an aspiring luthier - including me. When Bruce passed away unexpectedly last year he left a special project only partially completed. 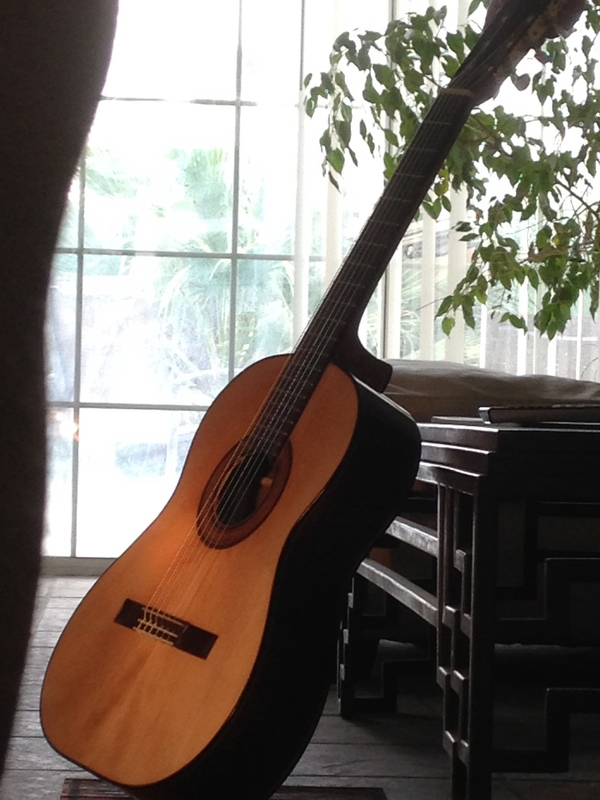 He planned to give his grandson this classical guitar as a present on his graduation from high school. I was honored to be asked to complete it. Here is a short :35 second video clip of the 2012 Custom 00-DM #06. It was recorded on an iPhone5 with no processing. Sam is on guitar. Arthur Seay of the stoner rock bands Unida and House of Broken Promises endorses Dey Martin Guitars. Arthur is also a personal guitar tech for some of the world's most famous rock bands, ie., Godsmack, Limp Bizkit, and Slipknot. Here is what Arthur Seay has to say about my guitars, "Dey Martin's guitars are totally handmade, precision and beautiful." "TOTALLY BADASS!" Here Arthur enjoys playing this Dey Martin 00-DM acoustic steel string. He started playing it and just didn't want to put it down so he promptly ordered one! Seay is now on European rock tour with Unida bandmate and singer John Garcia who is the former singer of famed desert rock act Kyuss. Unida guitarist Arthur Seay plays Dey Martin acoustic. Here is my model Q baritone custom ukulele. Aptly named because of the Q letter design of the sound hole. It was handmade to order for a bass player who loved his Kamaka baritone ukulele but wanted a longer neck and extra frets. I combined a cutaway with Kasha tonebars top and flipped the sound hole to the bass side. He loved it. OMG I'm on Twitter and Facebook! Please visit Twitter http://www.twitter.com/deyguitars and follow me @deyguitars and I'll keep you in the loop about special events, new instruments that become available, new vendors that carry my stuff and more! After you Follow me on Twitter, shoot on over to my brand new Facebook fan page at Dey Martin Guitars https://www.facebook.com/pages/Dey-Martin-Guitars/441340852642492 and "Like" it for special insider invites, spiffs, and free pony rides. Just another great way to keep you in the loop and up to date. Westwood Music Center in Los Angeles is now selling my guitars. I just hand delivered a beautiful 00DM Custom named Ruby to their store! This 00DM Custom has 14 frets clear of the body with Sinker Redwood top, Indian Rosewood back and sides and slotted headstock with gold Waverly tuners. Definitely a finger pickers dream. 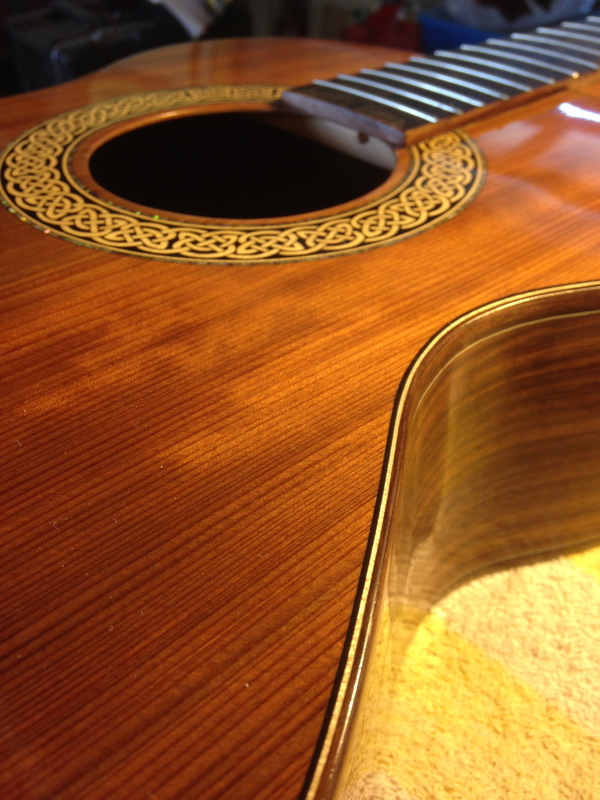 Warm with excellent sustain, beautiful abalone appointments and stunning Celtic motif rosette. An excellent guitar for recording with a pro mic. So if you were wondering where you can go try one of my creations, go to Westwood Music and tell them Dey Martin sent ya. This is it! The 00DM Custom Dey Martin Steel String Guitar ready for strings and set up. Now at Westwood Music Center. Strings included - of course!